Here's Adventure! Here's Romance! The Cisco Kid!! This color Western TV show presents the exploits of Cisco (Duncan Renaldo) and Pancho (Leo Carillo), a pair of Robin Hood style desperados in the Old West. Cisco is a flashy, sharp-shooting Don Juan and Pancho is his not quite fluent in English sidekick. Together they foil treacherous bad men with their daring stunts and ingenuity. The Cisco Kid ran from 1950 - 1956 and was the first TV series filmed in color, although it was not available for network broadcast in color until after 1960. 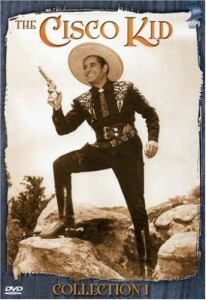 The show also was the first television show to feature Hispanic stars in (stereotyped) leading roles and was based on the Cisco Kid series of feature films from the 1940s. The song "Cisco Kid", recorded by the R&B band war in 1972, reached #2 on the US Pop charts. The band often opened live shows with a clip from the Cisco Kid TV show. The song was inspired by the fact that guitarist Howard Scott felt that as the only ethnic TV hero of the period, Cisco Kid was totally different, and Scott could relate to him in a different way than with other TV heroes of the time, so he sang: "Cisco Kid, was a friend of mine".